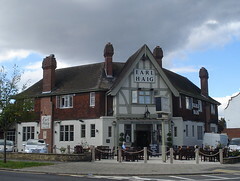 Ember Inns pub in Bexleyheath. It's a fairly standard Ember Inn, with colour-coordinated furnishings and the interior broken up into different areas. The majority of the space is available for dining, but there's also a reasonably spacious drinkers-only area around the side of the bar, with newspapers in a rack and a couple of fruit machines. There's chairs and tables out the front, and more in a garden out the back (along with a small children's play area). Kake visited on a Wednesday lunchtime in September 2014. The diners' area of the pub was almost entirely full at 1:45 pm, with people of all ages including children and babies, but there were only half a dozen people in the drinkers-only area. Music was playing, fairly inoffensive, not too loud. Although the bar has an impressive eleven handpumps, only three ales and one real cider were on: Oakham Inferno, Sadler's JPA, Harveys Sussex Best, and Westons Old Rosie. A glass of lime and soda (more than a half, less than a pint) was 50p. According to their website as of September 2014, food is served all day until 10pm, and there's a quiz on Sundays from 9pm. Accessibility: A step to get in at the main entrance. Once you're in, there's no further steps to bar, toilets (including accessible one with baby change), and most of the seating (including all of the drinkers-only area). There are steps to the garden at the back. Opening hours taken from the Earl Haig website, September 2014. Last edited 2015-09-12 13:58:52 (version 6; diff). List all versions. Page last edited 2015-09-12 13:58:52 (version 6).